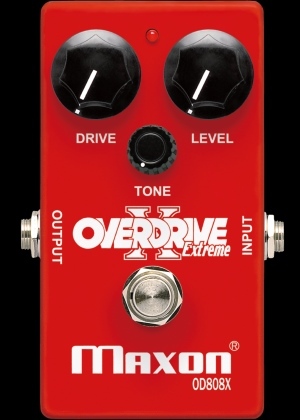 OD808X is based on the mild and natural drive sound of Maxon classic OD808 circuit. OD808X offers a different frequency response than the OD808 with an extended hi-frequency tonal range. This added range has been carefully tuned to provide clarity without becoming harsh, and it accentuates high-gain settings. OD808X offers more gain and harder clipping than standard OD808, creating amp-like distortion with excellent note definition and clarity. OD808X features buffered, JFET bypass switching with a low impedance output, allowing it to drive long cable lengths or othereffect units without loss of signal.